Following on the trails of the massive three-part series about structure networks, today we’ll dive into the scary depths of industry and make an attempt at explaining why it was necessary to turn it upside down. Be warned: it’s long and there is some heavy number-crunching ahead, but luckily there is a tl;dr at the end. As mentioned in the first PBS blog, we’re changing the current fixed position mineral fields to random spawns, where the fields won’t get “refilled”, but new fields will appear instead, once the current ones are depleted. 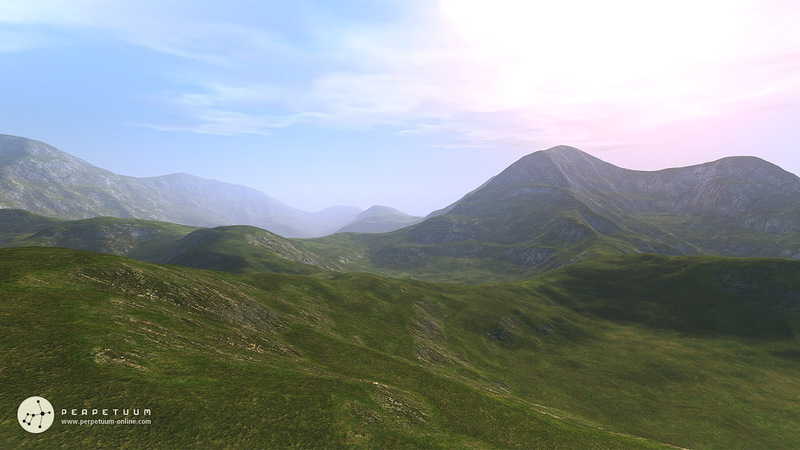 The change is first and foremost required due to the new terraformable gamma islands, because fixed mineral fields would interfere with the nature of free terraforming. However, we’re doing this not only on gamma islands, but on all alpha and beta islands too. The only difference is that on alphas and betas new mineral fields can only spawn on passable terrain, but on gammas they can spawn anywhere on the island, and you will have to terraform your way to them (this is a change since the terraforming blogpost). Our intention with this is to make the process of scanning for minerals more meaningful, maybe even to the point of turning it into a profession in itself, as opposed to the current system where you just need to find and map out all the fixed mineral fields and return to them like they were some kind of candy dispensers. Now, with the need for constant geoscanning for new fields you may think that it would be a very tedious task with the available tools, and you’re right. That’s why we’re replacing area-based geoscanner charges with brand new directional scanning charges. These will show you the direction to the nearest tile holding the charge-specific mineral, but not the distance. It’s somewhat similar to artifact scanning, but it will require different tactics. Notice I wrote “nearest tile”: it’s equally possible that it will guide you to a tiny residue, or to a tile which is part of a large field. Once you’ve found your spot, you can use the good old tile-based scanner to find out whether you hit the jackpot or not. In the long run, this system will require miners to do a “clean job”, as randomly scattered residual spots will soon make directional scans less and less efficient. This ties into the generation of new mineral fields: the system periodically checks the overall amount of minerals on each island, and if this gets under a certain threshold value, a new mineral field will be generated in a random spot. However, if the mineral map of an island gets too much fragmented by haphazard mining practices, the spawning of new fields will probably slow down, since the overall mineral amounts will be there, but scattered all around the island in lots of low-yield tiles. We’re also changing the mining process itself: the current method of storing “mining cycles” in ground tiles will be converted to a more straightforward system. Tiles will hold the exact amount of minerals you can get out of them, so there won’t be a “loss” of minerals when someone with less advanced equipment or extensions mines them; he/she will just simply extract less over time, without wasting any potentially minable minerals during the process. So far there hasn’t been much difference in the availability and usage of minerals and commodities among the three factions. Of course we’ve tried to make specific minerals more abundant than others, but this was a fragile balance, as the components used for manufacturing didn’t have such separation among the faction technologies. With the coming expansion we’re taking a big step to stir up this uniformity. Each of the three factions will have one distinct mineral that is representative in their specific technology. For Pelistal this will be Silgium, a brand new minable raw mineral, for Nuimqol it’s Imentium, and for Thelodica it’s Stermonit. Titan and HDT will have a role as common basic minerals used by all factions, and Titan will be reinstated to Beta, but these two will be still more abundant on Alpha islands. In the high-end mineral department, Epriton and Noralgis will be accompanied by a new mineral available only on gamma islands. At first this will be used for building higher tier PBS structures, but in the future it will be required for new robots and equipment as well. Of course if we differentiate raw minerals this way, we also need to do the same for the commodities that they are refined to, and consequently it will be also reflected in the equipment they are used in. Commodities will also get categorized by their role in manufacturing. This can be either basic component, offensive/weaponry component, defensive/armor component, or electric/energy component. Besides bringing more immersion into the game, this should also make it easier to remember what components you generally need for a type of module, and it should also help industrialists in specializing in a specific type of equipment. Both faction and type will be displayed on the icon of commodities. All this juggling with the components has the consequence that pretty much every robot and module will require completely different commodities compared the current setup on the live server. We did this in a way that the final price of things generally shouldn’t be too much different than what you’re used to, but be aware that there will be some changes. There is an intended “trend” too, namely that robots will require slightly more materials than before, and modules slightly less. Is your head spinning yet? Well we’re not stopping here, it’s time for some Hungarian Maths™! One major issue with how the current industry in Perpetuum works is its rather bad scaling: novice manufacturers have a very hard time keeping up with veteran industrialists, and the main reason for this is the tremendous gap between their efficiency. This makes it near impossible for beginners to have at least a small chance at providing goods at competitive prices. Of course, experienced manufacturers with high-tech facilities and tools should always keep their leading edge, but we’d like to lessen that efficiency gap and at the same time make the entry into the industry a less painful experience. Simply speaking, we’re turning all the facility-related calculations into the same point based diminishing system like the way armor resistances work for robots. Facility base efficiencies, your related extensions, your faction relation, etc. will all have a point equivalent and the sum of these points will be your final efficiency. Like in the case of armor resistances, this point value can be converted into a percentage value, which will always converge towards 100% efficiency, but it will never reach it. And similarly, the more efficient you are, the more harder it will be to improve on it. The graph on the right should help you understand it better. When accumulating production points (horizontal axis), it’s relatively easy to reach a good efficiency, but it will gradually get harder to really stand out. Factory efficiency for example starts at 150% time and material needs (compared to “perfect” efficiency), and closes to 100% from upwards. 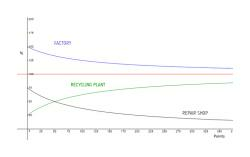 The recycling plant’s efficiency starts at 25%, and the more it closes to 100%, the more commodities you will get from items. The money you have to pay at the repair shop begins at 75% and converges to 0%, but will never reach it. The system makes the current level-classification of facilities obsolete, as their efficiency will be measured in production points from now on. For “fixed” (NPC controlled) alpha and beta terminals this won’t make a real difference, but in the case of gamma islands where you can attach any number of facilities and facility upgrades to the main terminals, it can be any number in between (and over!) the old level equivalents, too. Of course these points will still be displayed in the terminal information windows, so you can easily compare them from anywhere in the world. Calibration templates (CTs) deserve their own paragraph here: their efficiency will be also measured in production points, but the hard limit we had at 100% in the old system is completely gone. The point system makes this possible, because as I explained earlier, the overall production points “thrown” into the pipeline can be quite a lot, but your calculated efficiency still won’t ever reach 100%. Since the limit for improving CTs doesn’t exist anymore, you will be able to combine CTs in the new gamma-only calibration complex (mentioned in the 3rd part of the PBS blog) infinitely. But remember that it’s only production points what you’ll be combining there - the final efficiency in the factory will always boil down to something less than 100%. This also means that there will be a point where combining two CTs will gain you such a small efficiency increase that it won’t be worth to do it any further. The production point system also has a nice peculiarity: since efficiencies start to get better already at lower point values, it’s enough to have a really good CT to reach satisfactory results even without access to high-level facilities. Similarly, if you have very good industrial extensions, you can get away with mediocre CTs and facilities, and so on. But the important part is that there will always be some room for improvement. The manufacturing process itself will also change a bit. First off, factories will not just provide a boost to production times, but they will again have their own material efficiency bonuses. 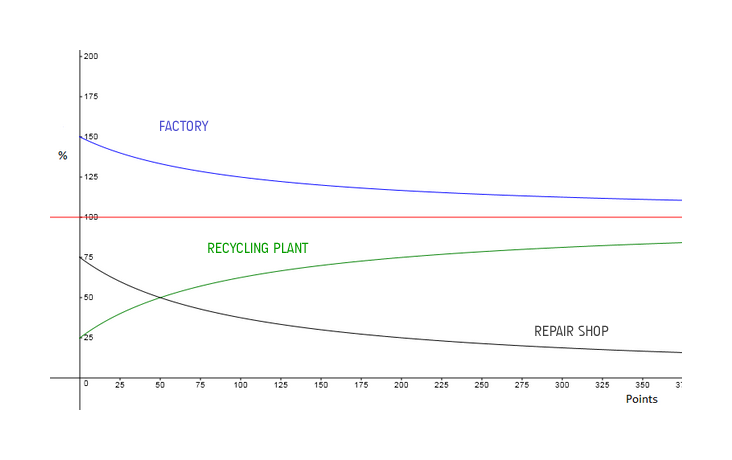 Second, the currently separated cycle and quantity in the factory will be merged into one, and CTs will be degraded with every item production cycle. To compensate for this, CTs will degrade much less in these cycles, and we have also boosted the extension that controls the maximum number of manufacturable items in one slot at a time to 10 per level (so 100 at level 10). There are still a lot of small details I didn’t cover, but this is already getting too long again, and we’ll also happily answer any specific questions in the comments below, should you have any. Still, there are two things that are not directly industry-related, but they are important enough to share with you. One. Scarab Mk2. 900U cargo space. Needs gamma minerals to build. Two. Navigation extension is dead. Since speed is such an important aspect of the game, it has always been a must-have extension for everyone, which is bad game design practice. It will get removed and everyone will have “level 10” by default. Oh, I almost forgot: all of this will come together with Player-Built Settlements, and as most of it is already done, you'll be able to test it on the public test server soon.